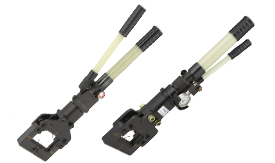 A complete line of ruggedly built, manually actuated tools for squeezing PE pipe sizes ranging from ½” CTS to 8” IPS. Small, light and powerful emergency shut-off tools for 2” IPS Schedule 40 coated pipe. Precisely administer pressure to hydraulic tools. To tackle the toughest jobs, when maximum force and precision is required, look no further than Mustang’s Heavy-Duty hydraulic tools for 6” to 12” IPS PE pipe. When additional compressive force is needed for difficult to squeeze PE pipe, Mustang Saddle Clamps are the answer. Safely channels hazardous static electricity into the ground and away from the work area and crew.